Libby has less than 90 stair climbs left before he has walked for all of the 343 firefighters lost on that fateful day. He walks up and up, steady and sure, sweaty but not out of breath. With each step, the lanyard around his neck — depicting one of the 343 firefighters who lost their lives on 9/11 — bounces on his chest. Starting from the second floor of the Bank of America Financial Center in downtown Spokane, Captain Roger Libby arrives at the rooftop level 19 floors later. He'll take the elevator down, then repeat the five-minute process six or more times to at least match the 110 stories of the World Trade Center Towers. The air in the stairwell is stagnant, and in the summer months the fire-engine-red handrails become hot to the touch the closer to the top Libby gets. It's a perfect place to get lost in thought and remember each individual he's walking for, Libby says. 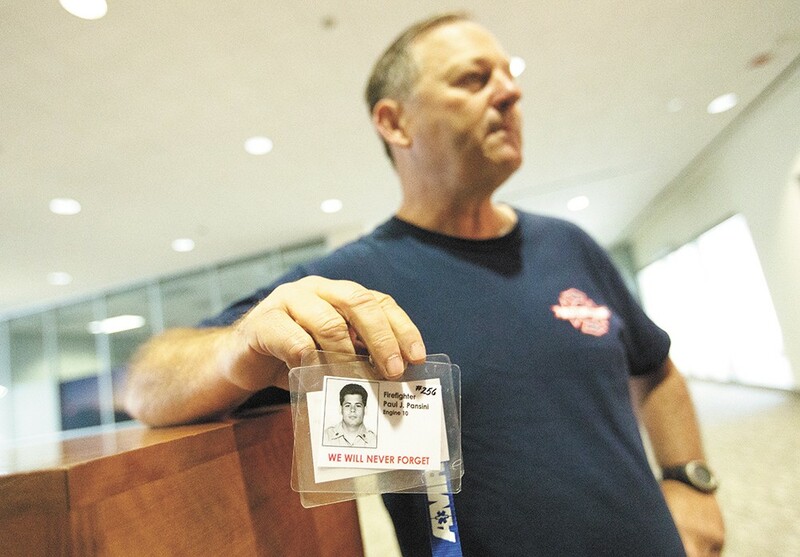 After the walk, he'll take the dated picture back to the memorial he's created in the glass display case at the Spokane Fire Department Training Center. Most of us remember where we were that day when two airplanes, filled with passengers and crew, were flown into the Twin Towers. The feelings of fear, the unknown. Libby was off-duty at home at the time. 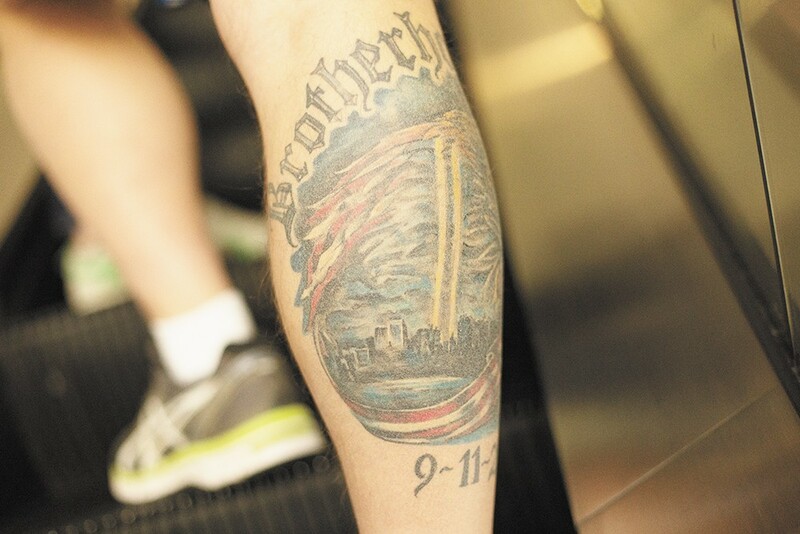 Spokane Fire Department Captain Roger Libby’s intricate commemorative 9/11 tattoo on his right calf took three sessions and 20 hours to complete. "I sat glued to my TV for six hours straight," the 63-year-old says last week at the Bank of America Financial Center. "I knew life would never be the same again." But still, we move on. In some ways we don't want to remember, even if as a nation we promised to "never forget." 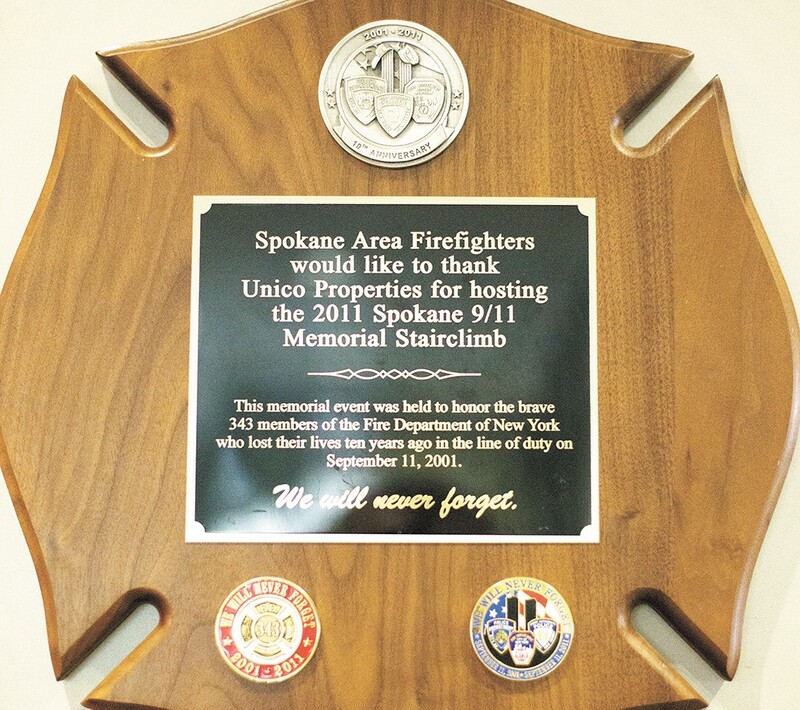 It all began in 2011, when the Spokane Fire Department held a commemorative 9/11 climb in the Bank of America stairwell. Libby trained for months to get in shape, and once it was over, he continued to climb just to stay healthy. But he wanted to honor the 343 lives lost, and do something to show them respect on a higher level. He'll walk before and after a 24-hour shift at Spokane Fire Station No. 8. He's walked for fathers and sons and brothers. "I am convinced they knew they would die that day, and I'm inspired by their patriotism," he says, emotion filling his eyes. "I can't say this job makes sense. We're the people walking into the burning buildings everyone else is running out of." Next Memorial Day, Libby will walk for the final firefighter on his list. He hopes to have plaques created to commemorate the occasion. He says when it's done, he'll have walked approximately 50,000 stories, a million vertical steps. "At first I did this all anonymously," he says. "But then I realized that by sharing my mission, I could could serve as a reminder to people." For this week of September 11, he'll be in New York City, visiting the 9/11 Memorial Museum.